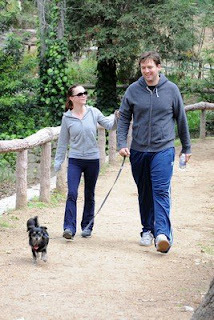 Actress Christina Ricci and comedian boyfriend Owen Benjamin are reportedly engaged. The two met on set of their movie All’s Faire in Love, and are of disproportionate height, Christina is a tiny 5′1″ and Owen is 6′6″. They went public with their relationship last October. E!Online claims Christina and Owen have already thrown a little engagement party but so far the reps. for both remain mum on the subject.